Hyundai’s 2.0 Theta and Theta II engines (G4KA, G4KD, G4KF, G4KH, and G4KL) already have a long production history and underwent many changes. The 2.0-liter engine of the Theta series is a four-cylinder gasoline engine firstly debuted in the Hyundai Sonata in 2004. 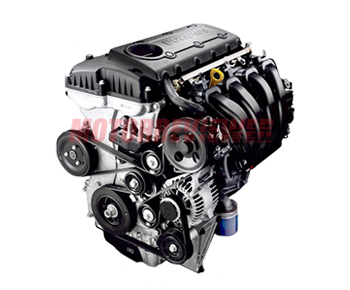 Depends on modification, the engine can be equipped with multipoint fuel injection (MFI) or direct injection (GDI). The manufacturer also began to produce turbocharged versions with GDI delivered a high level of performance and efficiency for its newest Hyundai and KIA vehicles. The G4KA engine was the first. It is a complete aluminum engine with a high-pressure die-cast aluminum cylinder block (open-deck type) and 16-valve DOHC cylinder head. The engine block is equipped with a cassette-type balance shaft module and a two-stage built-in oil pump. The bottom on the block is reinforced by a ladder frame. Inside the engine, you can find sinter-forged connecting rods and light-weight aluminum pistons. The intake and exhaust camshaft are driven by a timing chain. Continuously variable valve timing (CVVT) is applied for the intake timing only. The engine has an electronically controlled multi-point fuel injection (MFI) and electronic ignition. The intake manifold is made from plastic. The G4KD engine belongs to Theta II. The new engine is the entirely redesigned G4KA. It has the revised intake manifold, new connecting rods and pistons, the modified continuously variable valve timing (CVVT) system (actuators are placed on both camshafts), new stainless steel exhaust manifold, differently attached accessories, and new software for the engine control unit. Like the G4KA and all Theta engines, the Theta II G4KD doesn't have hydraulic lifters. There are shimless bucket lifters and valve clearance adjustment is required every 60,000 miles (100,000 km). The engine is well balanced, high-torque and runs quite smooth. The G4KF 2.0L Turbo is a turbocharged engine with a convenient port fuel injection which was used in the Hyundai Genesis coupe turbo form 2009 to 2014. The engine has a Twin-Scroll Mitsubishi TD04 turbocharger, CVVT for intake and exhaust timing, oil jets for pistons cooling, and lowered compression ratio to 9.4:1. The boost pressure is 15.9 psi (1.10 Bar). That version produced 210 hp at 6,000 rpm and 223 lb-ft at 2000 rpm on 87 gasoline. If using 93 gas, the power will rise up to 223 hp. In 2012, the engine received some upgrades with turbocharger and the boost pressure was increased to 18 psi (1.24 Bar). The new Theta 2.0T produced 274 hp and 275 lb-ft of torque. The interesting fact, the G4KF is pretty similar to Mitsubishi’s 4B11T engine and many of their parts are interchangeable. The G4KH and G4KL engines are the newest power units combined the direct gasoline injection and a twin-scroll turbocharger (the 2.0L T-GDI or Turbo GDI engines). The engineers installed the Mitsubishi TD04-19T turbocharger featured the quick response due to a redesigned turbine wheel with a reduced number of blades. The turbocharger also has an electronic wastegate which allows controlling boost more precisely and eliminating turbo lag. The boost pressure is 17.3 psi (1.19 Bar). These new engines got redesigned cylinder heads with reinforced valve seats and direct injectors. The high-pressure fuel pump (HPP) is mounted on top of the new cylinder head. It is actuated by a special lobe on the exhaust camshaft. The fuel delivered by HPP injects directly into each cylinder by multi-hole direct injectors. The new-shaped pistons increased the compression ratio to 9.5:1 (common numbers for turbocharged engines nowadays). Hyundai’s 2.0 T-GDI engines are more powerful than V6 engines and almost twice ahead in hp per liter compared to the first 2.0L Theta engine, at the same time consume less fuel than natural aspirated four-cylinder engines with the same displacement. The South Korean vehicle manufacturer uses 2.0 Theta engines not only in Hyundai and KIA cars but also in its luxury vehicle division – the Genesis Motors. The Hyundai Theta and Theta II family consists of two displacement versions, the 2.0L, and the 2.4L Theta engine. The reliability is not the strongest side of this engine. The manufacturer made recall companies for vehicles with 2.0l Theta II engines several times. Most of them were related to mechanical problems with serious/critical wear of moving parts: crankshaft, pistons and pistons rings (scratches on cylinder walls). Some failures lead to problems with oil flow caused the engines to seize. Theta engines produce a lot of noise at starts and cold engine temperature. A noisy operation is quite common for the 2.0L Theta engine. The sound reminds an old diesel engine. Chirring noise makes owners nervous, but that is just the work of the fuel nozzles (injectors). Some vibrations at 1000-1200 rpm are normal. The manufacturer did not lay in the engine greater durability. But the main point of that is a dirty cheap price. The average engine life is about 150,000 miles (250,000 km). G4KA - 143 hp (107 kW) at 6,000 rpm, 140 ft-lb (190 Nm) at 4,000 rpm. This is the first 2.0 Theta engine. Application: Hyundai Sonata, Hyundai NF, Kia Carens, Kia Forte, Kia Magentis. G4KD - 163 hp (122 kW) at 6,200 rpm, 146 ft-lb (198 Nm) at 4,600 rpm. It is a 2.0L Theta II engine with dual VVT. The engine was used in: Hyundai Elantra, Hyundai NF, Hyundai Sonata, Hyundai Tucson, Hyundai ix35, Kia Cerato, Kia, Cerato Koup, Kia Forte, Kia Magentis, Kia Optima, Kia Sportage. G4KF - 210-223 hp (156-166 kW) at 6,000 rpm, 223 ft-lb (302 Nm) at 1,800-3,500 rpm. Since 2013 the power output changed - 274 hp (204 kW) and 275 lb-ft (373 Nm). The G4KF is the Hyundai Genesis Coupe engine. G4KH - 240-274 hp (179-204 kW) at 6,000 rpm, 260-269 ft-lb (353-365 Nm) at 1,800-4,800 rpm. The engine specs depend on vehicle application. The engine is used in the Hyundai Santa Fe, Hyundai Sonata, Hyundai i30 N TCR, Kia Sportage, Kia Optima, Kia Sorento. G4KL - 197-247 hp (147-184 kW) at 6,000-6,200 rpm, 260 ft-lb (353 Nm) at 1,800-4,800 rpm. Application: Kia Stinger, Genesis G70, Genesis G80.